Please read the two posts introducing the Philadelphia's Mural Arts Program and The Mural Mile before you follow the photo tour. You can also begin the tour with the First Mural. This mural depicts the progress made in women's rights. 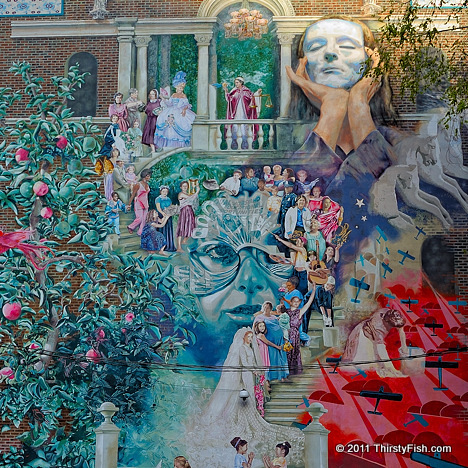 Although barely visible in this photo, the mural contains a watermark that reads, "Equal Jobs and Educational Opportunities". The masks worn by some of the women represent the social pressures and problems women have faced (and continue to face) in their progress towards equality. The mural decorates the wall of the New Century Guild building. New Century Guild, founded in 1882 by Eliza Sproat Turner, was one of the earliest, largest and most successful organizations that dealt with women's problems and rights as they entered the labor force. In the United States, women's suffrage, the right of women to vote and to run for office, was ratified by the Nineteenth Amendment in 1920; only 90 years ago! Although great progress has been made since, women continue to face hardships in society. For example, there continues to be a "gender gap in earnings".